Then you’ve come to the right place. Emma's Kitchen the home-based cookery school, run by Emma Smith, is here to help. Our cookery classes can boost your confidence and inspire you with exciting new recipes. We offer a range of practical, hands-on classes to give you hints, tips, skills and recipes for you to recreate in your own home, from midweek family meals to show-stopping dinner parties. 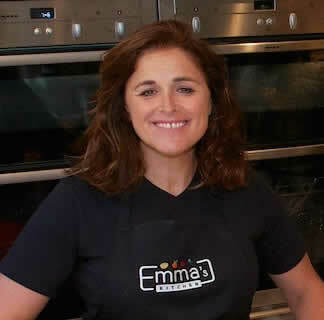 Emma's Kitchen was founded by Emma Smith, an experienced cook who is passionate about making (and eating) delicious food. She set up Emma's Kitchen in 2016 in response to growing requests from friends and neighbours for cooking and recipe advice. Emma is married with three children. When she’s not in the kitchen she is busy running a private nursery for local pre-school children.